Free Shipping Included! Mint Julep Cocktail Essential Tool Kit - (2) 12oz Cups, Lewis Bag, Muddler/Mallet and Recipe Card (5 items) by The Curated Pantry at Marion Street Deli & Pub. Hurry! Limited time offer. Offer valid only while supplies last. 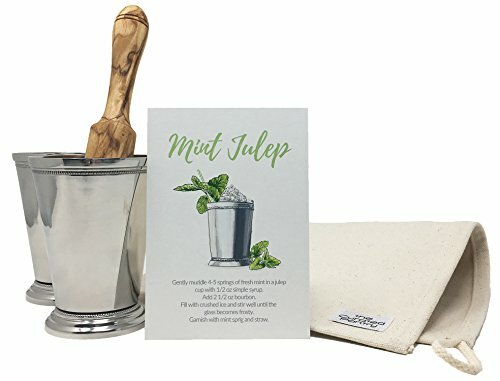 This mint julep gift set will have you ready to churn out cocktail after cocktail during your Kentucky Derby party and or anytime the urge for a tasty mint julep hits you. Included in this kit is the most durable lewis bag on the market for home use handmade by McSology exclusively for The Curated Pantry. It is made with #8 duck canvas with the highest attention to detail. Wicks away water unlike any other, leaving you with crushed ice of the proper consistency needed for juleps, mojitos and such. Measures 16" x 8.5". Made in the USA. Olive wood muddler is great for muddling mint and it also doubles as a mallet for crushing ice in the lewis bag. Hand carved in Tunisia. Recipe card printed on extra thick uncoated luxe paper with green inseam. Measures 5.82" x 4.13". If you have any questions about this product by The Curated Pantry, contact us by completing and submitting the form below. If you are looking for a specif part number, please include it with your message.